Mormon Wookiee: #119: Part One: Salt Lake Valley Regional Conference - 9/15/2013. #119: Part One: Salt Lake Valley Regional Conference - 9/15/2013. What a great day. This morning we had a "regional" stake conference, made up of 116 stakes throughout the Salt Lake Valley. 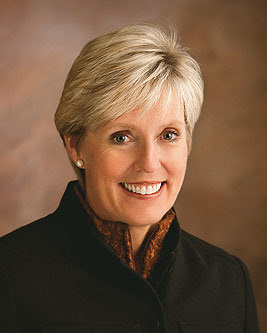 The conference session was broadcast from the Conference Center in downtown Salt Lake City. We heard from Elder L. Whitney Clayton, President Rosemary Wixom, Elder Russell M. Nelson, and President Boyd K. Packer, all of whom gave excellent talks. President Wixom is a good friend of my wife Diane's parents, Ben and Diane. My favorite part of the conference was a wonderful surprise when President Wixom briefly told the story of Ben and Diane's conversion to the gospel nearly 40 years ago. It was a special treat, considering that Diane was visiting us from out of town and was able to hear the talk. As there is no official transcript of the talks, I tried to type as quickly as I could while the speakers spoke. If you were unable to attend the conference today (or even if you just want to revisit the talks), feel free to check them out below. In this post I have included the first two talks by Elder Clayton and President Wixom. In my next post, I will post the concluding two talks by Elder Nelson and President Packer. UPDATE: You can find my post of Elder Nelson and President Packer's talks at this link. I would like to speak today about anchors. In 2002, the country of Argentina was experience great economic distress. Unemployment equaled 20%. These difficult economic circumstances also directly affected the neighboring countries of Uruguay and Paraguay. I received an assignment to go to Asuncion, the capital city of Paraguay to meet with the six stake presidents from the area. We met in a chapel near the temple. I knew that these stakes had many challenges. I decided not to offer them much counsel, but instead to simply listen to them. Rather than dwelling on the problems they were facing, I asked them to tell me about the strengths of their stakes and what was going well. The first stake president spoke of what was going well and then added a few problems at the end. The second spoke of what was going well and then spent some time focusing on a few more problems. The third spent half on the good and half on the problems, until the sixth stake president spoke only of the problems. As the stake presidents grew increasingly more negative, I began kicking myself mentally. "You have really painted yourself into a corner. Way to go!" As I was beginning to feel desperate, a thought suddenly came into my mind. "Ask them of who, among those in their stakes who pay their tithing, faithfully fulfill their assignments, etc., how many of those people in their stakes have problems that they cannot handle on their own." So I asked them. None responded. So then I asked them again. They all said of those people who faithfully obeyed the commandments, there were none who could not resolve their own problems. Those members were able to meet life's challenges without needing the church to step in. Those who faithfully follow the commandments of God are blessed and have the spiritual resolve to face the challenges of which they are confronted. Almost miraculously, they find strength, courage, and faith in times of need. Consider the commandment to pay tithing. It is a very simple commandment. But the promises that follow are extraordinary. Consider the promises given by the prophet Malachi: "Bring ye all the tithes into the storehouse, that there may be meat in mine house, and prove me now herewith, saith the LORD of hosts, if I will not open you the windows of heaven, and pour you out a blessing, that there shall not be room enough to receive it. And I will rebuke the devourer for your sakes, and he shall not destroy the fruits of your ground; neither shall your vine cast her fruit before the time in the field, saith the LORD of hosts. And all nations shall call you blessed: for ye shall be a delightsome land, saith the LORD of hosts" (Malachi 3:10-12). Another example of promised blessings comes from the payment of a generous fast offering. They are remarkable. Speaking through the prophet Isaiah, the Lord said, "Then shall thy light break forth as the morning, and thine health shall spring forth speedily: and thy righteousness shall go before thee; the glory of the LORD shall be thy rereward. Then shalt thou call, and the LORD shall answer; thou shalt cry, and he shall say, Here I am. If thou take away from the midst of thee the yoke, the putting forth of the finger, and speaking vanity; And if thou draw out thy soul to the hungry, and satisfy the afflicted soul; then shall thy light rise in obscurity, and thy darkness be as the noonday: And the LORD shall guide thee continually, and satisfy thy soul in drought, and make fat thy bones: and thou shalt be like a watered garden, and like a spring of water, whose waters fail not" (Isaiah 58:8-11). When we keep the commandments of God, we anchor our souls to the bedrock of eternity and to the living gospel. This process is just that--it is a process. It happens gradually, line upon line. But with each new day and each act of obedience, the anchor for our souls becomes stronger and stronger. Each time we keep a commandment, our connection to the Savior grows stronger and it leads us to abound in good works. This is why those stake presidents observed that righteousness leads to blessings. They enjoyed the happiness that inevitably follows--happier marriages, happier homes, and freedom even during those dire circumstances in Paraguay in 2002. Knowing the truth had made them free. One time while on vacation, my brother and I were swimming in the ocean. We looked down and saw an anchor buried about 20 feet deep. We dove down and tried to pull it up. It was four feet tall and very heavy. We spent hours diving down again and again, slowly moving it to the shore and finally pulled it up onto the beach. It was not connected to anything. We did not know how long it laid in the sand. We who are at this regional conference today live in the center stakes of the Church. Many of us are descendants of generations of members who also lived in the Salt Lake Valley. They were solidly anchored. Other members are newer, but likewise they are pioneers with homes of faith. Traditions of righteousness have been handed down from one generation to another and from neighbor to neighbor and from friend to friend. We would almost appear to inherit gospel roots, as if faith were part of the soil on which are homes were built. However, this is no guarantee--the next generation will not survive spiritually without effort and paying the price. The benefits of living in a peaceful place may continue, but the Spirit of the Lord cannot pass on and be inherited or delivered like a plate of brownies. The blessings of the Spirit are earned by each generation themselves. Each must faithfully keep the commandments. Thus, it is vital that we help our children, grandchildren, neighbors, and friends to obtain this same conversion. We must teach them by faith and by example. The building of faith occurs when parents teach and show their children how to pray and to walk uprightly before The Lord. Also, the admonition to warn our neighbors stands in place and is best accomplished when we first warm them through genuine friendship. I think often of that anchor on the shore. At one time, it might have offered a safe harbor. But it couldn't anymore. Someone decided he didn't need it and sailed away without it. 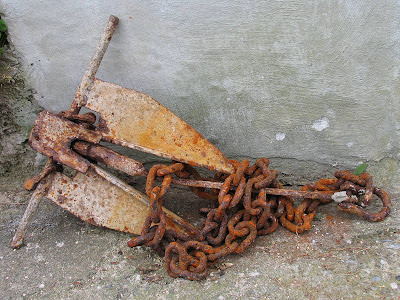 Our children need the strength of our anchors while they forge their own anchors through their personal obedience. We should not cast them unprepared and unconverted from our homes without the scriptures as their charts, the Spirit as their compass, and the blessings of God to fill their sails. The prophet Mormon said, "But now, behold, they are led about by Satan, even as chaff is driven before the wind, or as a vessel is tossed about upon the waves, without sail or anchor, or without anything wherewith to steer her; and even as she is, so are they" (Mormon 2:18). Similarly the prophet Ether taught, "Wherefore, whoso believeth in God might with surety hope for a better world, yea, even a place at the right hand of God, which hope cometh of faith, maketh an anchor to the souls of men, which would make them sure and steadfast, always abounding in good works, being led to glorify God" (Ether 12:4). May we all anchor our souls firmly in the gospel of Jesus CHrist. He, and his Father will bless and protect us. The predictable blessings that follow obedience will always follow obedience. In the name of Jesus Christ. Amen. Patricia was a young mother of four children. She loved light, warmth, order, and cleanliness. As a result, she vacuumed a lot. Her husband Ed came home one day and said, I know what you'll be doing in the eternities. You'll be the chief vacuumer." Patricia thought, "No! I can't keep spending all of my time doing this!" The next day she got a babysitter, began fasting, and went out alone to her parents cabin. While at the cabin, she spent the day prioritizing and sorting out her life. She knew that getting her family back to Heavenly Father was her top priority. As she worked her way down the list, she discovered that keeping her house spotless and clean fell to the bottom of the list. She drew up a plan and overlaid her list on the family calendar so that she could ensure that her plan would happen. She went home excited because she knew exactly what she wanted to do. She told Ed about her experience and then encouraged him to do the same--Ed then went through the same exercise. Patricia said, that it was a wonderful turning point for our marriage and family. Our priorities changed for the better. We all have similar opportunities to get our lives in order. Time spent seeking personal revelation for ourselves and our families is time well spent. Speaking to her husband Adam, Eve joyfully once said: "Were it not for our transgression we never should have had seed, and never should have known good and evil, and the joy of our redemption, and the eternal life which God giveth unto all the obedient" (Moses 5:11). Eve could see the lively hope of living with Heavenly Father again. She wanted that blessing for her family. Elder Bruce C. Hafen once said: We can have eternal life if we want it, but only if there is nothing else we want more" ("The Atonement For All", 2004). Adam and Eve understood the Lord's plan. They understood that they shared the full plan and blessings of the priesthood. They shared a desire to make and keep sacred covenants. They blessed the name of God and taught all these things freely to their sons and daughters. So what more can we learn from them? I would like to highlight three key things. First, they cleaved to their covenants and to each other. They remained faithful. Our first covenant was at baptism. Elder Robert D. Hales said: "Do you understand and do your children understand that when they are baptized they are changed forever?...When we are baptized, we take upon ourselves the sacred name of Jesus Christ. Taking upon us His name is one of the most significant experiences we have in life. Yet sometimes we pass through that experience without having a full understanding" ("The Covenant of Baptism", 2000). Adam and Eve cleaved to each other! For many years, my friend Leo took care of his wife Raquel, who was very sick. On Sundays they sat on the back row. Each week he would help her take the sacrament by lifting the cup to bread and water to her lips. I noticed that they always held hand throughout the meeting. He once told me, "Where she goes, there goes my heart." I am reminded of the following verse of scripture: Thou shalt love thy wife with all thy heart, and shalt cleave unto her and none else" (D&C 42:22). That "none else" may include work, exercise, entertainment, or social media. These things may begin to slowly substitute the time we could be spending with our spouse. Even if you are single, cleave to this truth. 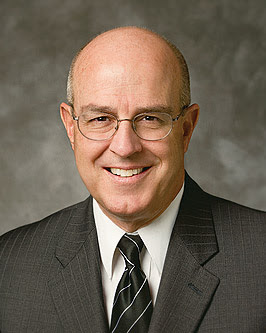 Elder Richard G. Scott once said: "The Lord will keep His promises. In His infinite wisdom, He will make possible all you qualify in worthiness to receive. Do not be discouraged. Living a pattern of life as close as possible to the ideal will provide much happiness, great satisfaction, and impressive growth while here on earth regardless of your current life circumstances" ("First Things First", 2001). Second, Adam and Eve labored together. 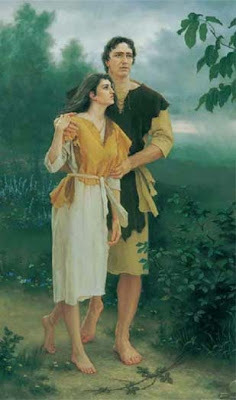 "Adam began to till the earth...and Eve, also, his wife, did labor with him" (Moses 5:1). The key word is WITH. Their names are seldom spoken separately. They lived their lives together. Applying this principle applies to our families. We should often ask ourselves, "What experiences could we have with our children to strengthen their development?" A young couple, Amy and Brent, asked themselves that question, as well as the following: "What if, rather than dance or sports, we asked our children to stay home more often and we did things together as a family?" For one year, Amy and Brent decided to forgo dance, sports, and all those other ativities, and spent time together. They cooked together, they camped together, they played games together.Their children felt the Spirit because they took the time to stop and listen. Conversation is at the root of every precious relationship we enjoy. That is the story of one family's choice. We are entitled to make choices for our own families. If we allow Him, the Lord will inspire and give us the courage to make those hard choices. Families used to work together out of necessity. Today we outsource our children at a rapid pace. Some children see themselves as part of a soccer team before seeing themselves as a part of a family. Finally, Adam and Eve called upon the Lord in prayer. "Therefore ye must always pray unto the Father in my name" (3 Nephi 18:19). Every Christmas season, Nels and Suzanne would pray to be able to identify a family they could help. They lived in a small town and Nels was trying to get his struggling business off the ground. However, as they prayed and looked around the community, they found a family with much greater needs than their own. They talked to their three young boys about what they could do. Their resources were limited, but their desire to help was overwhelming. They prayed about how they could help the family. Suzanne said, "One morning as I was pondering the impossibility of the plan, I felt inspired. I had a five gallon bucket of high quality flour. I could make and sell cinnamon rolls. We did a test run and I said many silent prayers during the process. I taught my son Peter what to say. 'Hi, my name is Peter! I'm selling cinnamon rolls to help a family in need this Christmas. $2 a piece.'" They made $60 in two hours. Many batches of cinnamon rolls later, they were able to raise a generous and anonymous amount to help the family in need. They never found out the family's reaction, but they did know that they had been called to be instruments in the Lord's hands through prayer. Over 25 years ago, Pres Kimball said: In the past, having family prayer once a day may have been all right. But in the future it will not be enough if we are going to save our families" (as quoted by President James E. Faust, "The Greatest Challenge in the World--Good Parenting", 1990). I want to tell you one last story about some friends of mine (Diane's parents--Ben and Diane). When they were first married, they did not want to have any children. However, they were soon baptized as members of the Church. Over the next 15 years, they had seven children. Whenever I visited their homes, it was clear that the concept of eternal families was taught in their home. Some signs of this doctrine were on post-it notes on mirrors that said "We can be a family forever." Their faith was literally written on the walls of their homes. To this day, it has served them well. A photo of Ben and Diane's family at our wedding six years ago. We are so blessed by the gospel! Each of these families sought revelation through prayer and have felt the blessings in their families. Not one of those families is perfect, but they do desire it. Through the Savior's atonement, our families too may one day reach that perfection. If we labor together, pray together, and listen to the Spirit of the Holy Ghost, we will begin to see life in that eternal perspective. If this is what we want and we want nothing more, we will get it. I say these things in the name of Jesus Christ. Amen. 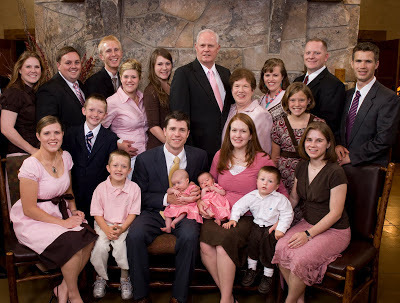 Great family photo...I love the pink on everyone! Do you know when you'll have the rest of the talks up? Thanks for doing this! Absolutely! I am planning to finish updating my notes from Elder Nelson and President Packer by no later than Tuesday night. Thanks for your interest! I have now posted the remaining two talks. Sorry it took me a bit longer than I anticipated. Thanks! I was so disappointed to miss the conference - thank you so much for taking the time to do this! It is very appreciated. I'm glad I could help. I will have the remaining two talks posted soon. Thanks! I have now posted the remaining two talks. My apologies for the delay. Thank you for publishing Regional Conference Talks. I am looking forward to reading President Packer's talk. Thanks, again. You have helped me so much! I wanted to share this story about Nels and Suzanne in Relief Society but couldn't find a transcript! Thank you so much!